Nothing annoys me more than having my tunes in one place (my PC) and my audio equipment somewhere else entirely – like my car, for example. Sure, I can transfer my tunes onto my MP3 player or my mobile phone, but if I want to listen to them on my car stereo, which doesn’t come equipped with a line-in jack, never mind Bluetooth or a USB port, then I have to resort to one of those FM transmitter add-ons. That would be fine if they worked OK, but once you start travelling across the country, you soon find yourself having to retune them as you stray into an area where the local radio station is broadcasting its warblings over the frequency you’ve selected for your MP3 player or mobile phone. Fortunately, help is at hand with the new Sony Ericsson AB900 wireless car speaker phone. The AB900 is, as you’d expect, yet another FM transmitter that lets you plug your mobile into and broadcast your music wirelessly on an FM frequency, where it’s picked up by your car stereo. Where the AB900 differs from ordinary wireless transmitters, though, is that it uses RDS to automatically locate a spare frequency, and then locks onto it so the transmitter doesn’t drift as you drive around. Even better, should you stray into an area with a competing transmission on the same frequency you’re using, the AB900 will automatically retune itself. The result – uninterrupted music broadcast from your mobile phone or MP3 player to your car stereo. It doesn’t end there, though. Because the AB900 was designed for mobile phones, it also integrates tightly with your phone’s features. It’ll pair with your phone via Bluetooth, and let you take calls completely hands-free. Better still, it’s battery operated (it offers 26 hours of talk time between recharges) and clips to your sun-visor, so you can take it from car to car – no messy installation problems. The Sony Ericsson AB900 – the perfect audio streamer? 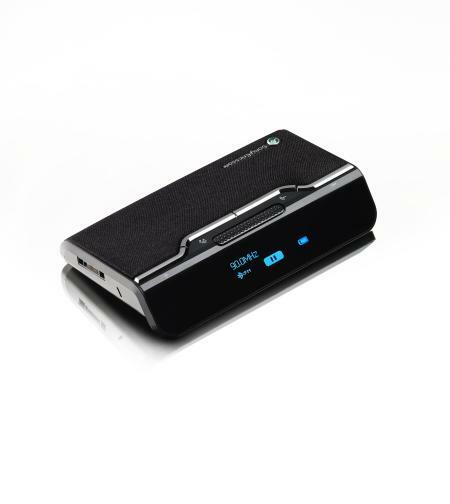 In many ways, the Sony Ericsson AB900 is the perfect wireless audio streamer. There’s no annoying wires between your phone or Bluetooth MP3 player and your stereo; no power cords needed to your cigarette lighter; no more fighting the frequency selector of your car radio; and great portability and hands-free functionality to boot. Makes you wonder why no-one else came out with a wireless audio streamer like this years ago!